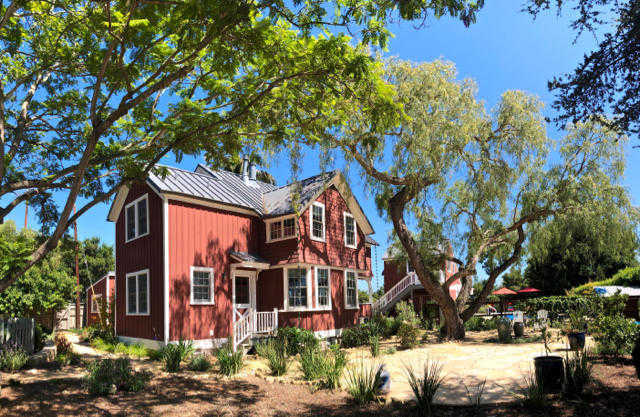 MLS# 19-1213 - 1189 Ontare Rd, Santa Barbara, CA 93105 - Andrew "Andy" Adler — Century 21 Butler Realty, Inc.
Rustic, refined and remodeled with impeccable quality and craftsmanship, this original Santa Barbara Farmhouse is not only captivating in style but a way of life. The setting is rural urban farm on .36 flat acre located in upper San Roque. The owners lovingly brought the home back to life while keeping its' original integrity and natural elements. Entering from the covered porch, the main level features a completely remodeled kitchen with pantry, an added mud room, laundry room, powder room and cozy mini office space, along with a charming living room with fireplace and beamed ceiling, separate large dining room and a bonus room. Upstairs are 3 bedrooms, one of which is a well-designed remodel addition of a master bathroom in the master bedroom. There is an additional full bath and reading nook upstairs. The farmhouse color palette wraps you like grandmothers quilt; a down home feeling of comfort and fun. Added remodeled sqft makes this luxurious farmhouse approx.1998 sqft. Plus a separate 2-car garage with upstairs 309 sqft studio was built in 2018. The studio features a full bath and kitchenette and overlooks the sparkling pool. Keeping with a true urban farm, the landscaping boasts mature trees, meandering stone pathways, stately palms and a picket fence surrounding a raised organic garden. Historically charming, everyone in town recognizes the red farmhouse on North Ontare. It is time for new memories to be made and treasured. Please, send me more information on this property: MLS# 19-1213 – $2,350,000 – 1189 Ontare Rd, Santa Barbara, CA 93105.